SSASM is developed by Nanjing Swansoft Technology Company. 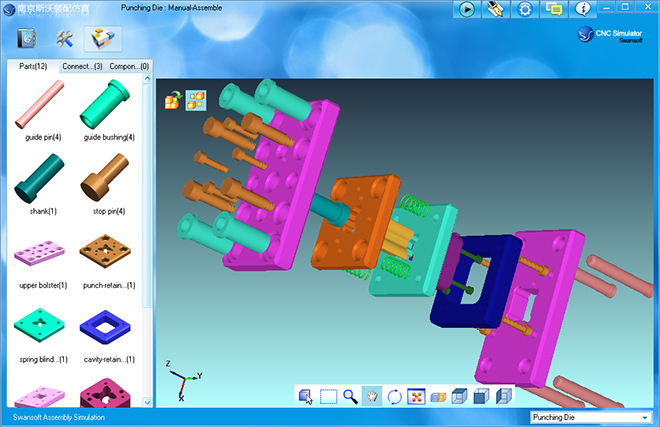 It is a 3D Assembly Simulation software designed to learn mechanical assembly. It is suitable for students to do self learning, for it has powerful functions such as assembling and disassembling automatically or by manual with 3D virtural interaction. It supports parts and components' assembly and disassembly. The operation information will be recoreded during assembly/disassembly. Network version is suitable for vocational and technical school or colledge to teach machine assembly. Teacher can examine and supervise online over SSASM server and communicate with students in real time. 2. Dynamic rotation, zoom, move,etc. Teachers register their username and password through SSASM server, student may login into the network version of SSASM in any PC using local area network, Teacher can centralize the management and monitor students over local area network. Teacher may add and edit exercises in SSASM server. Teacher can transmits the exercises with pictures included to clients (students). Then students write the answers and transmit back to the teacher. SSASM server builds up an easier and more convienient way for teacher and students to communicate with each other. SSASM server records students' operation information according to their registration information. It can control and inquire students' login and logoff and machining operation information. At the same time , the teacher can also broadcast his screen to students. The Teacher can assist students via Remote View and Control Client PC.